When creating a car for the SEMA show, the annual aftermarket tuning event held in Las Vegas, most manufacturers default to a simple ‘big wheels and low suspension’ formula. Not so Nissan for 2018, which enlisted Nissan Motorsports to build the 370Z-based car you can see here. Called Project Clubsport 23 it swaps the standard 3.7-litre naturally aspirated V6 for a new turbocharged V6, and while the tough stance that’s de rigueur for SEMA is still evident, the suspension and chassis parts may make up a Nissan-approved parts package for the 370Z in the future. Nissan’s intention was to make Project Clubsport 23 a car that current 370Z owners and enthusiasts can recreate. However, one element that won’t be so easy to retrofit will be the Clubsport’s 3-litre twin-turbo VR30DDTT V6, which has been borrowed from the Infiniti Q60 S. The new engine may be down around 700cc on the 370Z’s original motor, but thanks to forced induction it produces 400bhp – an increase of more than 50bhp over the 370’s standard V6. For the new engine to fit in the two-seater coupe it needed a bespoke intake and exhaust system. The Clubsport is fitted with a cold-air induction system, while US-based Nissan specialist MA Motorsports created a full 76mm-bore exhaust that now exits through the rear bumper rather than beneath it. Nissan recognises that the 370Z’s manual gearbox is an important part of why the model is so popular with enthusiasts, so the six-speed manual remains. To make the turbo V6 and gearbox work together meant having a new clutch and flywheel assembly developed, again by MA Motorsports. The differential hasn’t been left standard, but instead of using an aftermarket part Nissan has taken the LSD from the 370Z Nismo and added it to the Clubsport’s rear axle. Although Project Clubsport 23 is just a show car for SEMA, rumours suggest that the 370Z’s replacement will be fitted with a turbocharged V6 – possibly the very engine seen here. Going to such lengths to mate the motor to a gearbox that’s appropriate for a sports car might suggest that this could be part of the early development process for the 370Z’s successor. Nissan has also upgraded the 370Z’s chassis and brake system to complement the extra power. 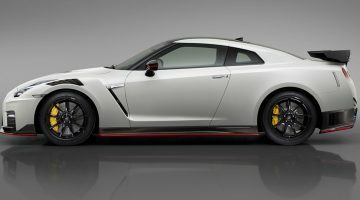 The brake calipers have been kept standard, but the pads have been replaced with Nismo-spec items, the discs substituted for two-piece rotors and the rubber brake lines for stainless steel braided pipes. The standard springs and dampers are gone too, and in their place are KW Variant 3 coilovers with Eibach springs. The car is also equipped with 370Z Nismo body bracing. The most notable change to the exterior of the Project Clubsport 23 are the wheels, which are a set of black 18-inch Rays alloys. However, there are subtle additions to the body, including a carbonfibre splitter, bonnet and mirror covers, a central rear fog light, AeroCatch bonnet latches and those high-up exhaust outlets. There’s no deny that the 370Z is an old car now, but it’s encouraging that Nissan is still willing to invest in its characterful entry-level sports coupe and clearly values the model’s enthusiast buyers.